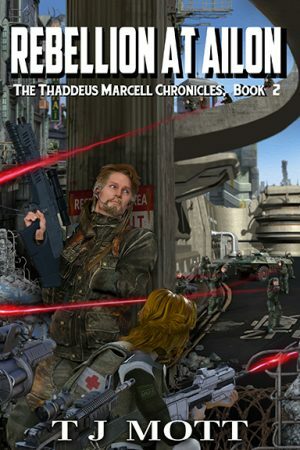 Book 2 of the Thaddeus Marcell Chronicles has been released! In this sequel to “Rescue at Waverly”, mercenary leader Thaddeus Marcell decides to take some time off from his organization to heal and reflect. Using a false name, he heads to an enslaved world called Ailon, where he quietly volunteers with a medical charity while contemplating his violent history as a mercenary and what he should do with his future. But things on Ailon are not what they seem. Thad soon finds himself caught up in a brewing insurrection, one that hopes to evict the world’s brutal and uncaring occupiers and free the Ailonian people. But this new rebellion, led by an incompetent officer who survived the world’s last rebellion, is naive and poorly-trained, sure to lose any war they begin and bring deeper suffering to Ailon. To Thad, one thing is clear: The new Ailonian Rebels desperately need someone with his leadership skills and combat experience. Yet getting involved could be the riskiest move of his life. If his cover is blown and his true identity is discovered, the Rebels are sure to execute him, because Ailon’s enslavement is Thad’s fault!